Do you have a family member diagnosed with osteoporosis or fracture after a minor fall? Have you ever had a fracture after a minor fall? Have you taken steroid tablets for more than 3 months? Does your upper back look more rounded than normal? Do you weight < 50kg? Do you regularly drink excess alcohol? Did you undergo menopause before the age of 45? Have your periods stopped for 12 months or more (other than because of pregnancy)? 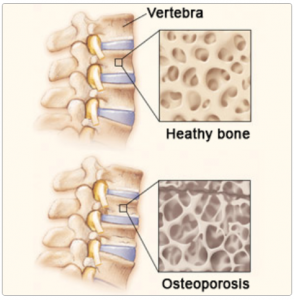 This could be osteoporosis. Consult a Rheumatologist. Delay can cause fracture and disability.